With our mission to serve high-achieving, low-income students, we were excited to learn about the launch of Pell Abacus, a free online tool that collegebound students and their families can use to estimate costs at over 5,000 colleges and universities. 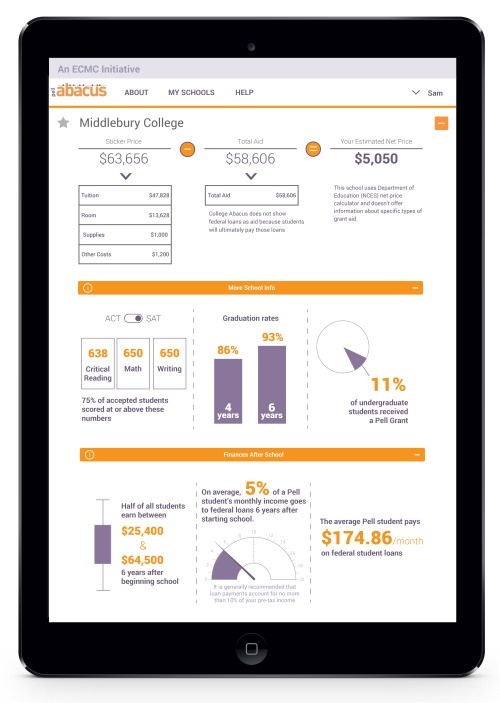 Pell Abacus uses institutional net price calculators and data from College Scorecard to generate helpful dashboards that show individualized financial aid estimates for students who are eligible for the Free and Reduced Lunch program. Understanding that many low-income families rely on mobile devices for internet access, Pell Abacus is designed to be mobile-friendly. The desktop site additionally dispalys information on the percentage of Pell recipients at a college or university, as well as the average amounts of their loan payments and monthly income percentage spent on those repayments after college. Click here for more information on Pell Abacus and here to learn more about how College Abacus is integrating the Obama Administration’s new College Scorecard data.